Christmas Tree Lots: Who Are The Folks Who Keep The Season Bright? Jessica Tansey was driving around Chicago the weekend after Thanksgiving when she noticed a sudden addition to her neighborhood. We want to wrap up the answer before the holidays end, so we’re skipping the “week/year in the life” part to focus on the heart of it: Who are the people that run these lots and how do they run their businesses? We learn there’re lots of ways to keep a tree lot business humming, but here’s what they have in common: The holiday season goes by quickly, so they have to hustle. Let’s start with one of Chicago’s oldest and biggest tree lot operations — fittingly called Chicago Christmas Tree Lots. It’s run by Gregg Arneson, who works construction in northern Wisconsin for most of the year. But for about a half century, he’s spent the holiday season in Chicago selling trees. Arneson says his grandfather was one of the city’s earliest tree retailers, cutting down wild trees in the woods and sending them to Chicago by schooner. 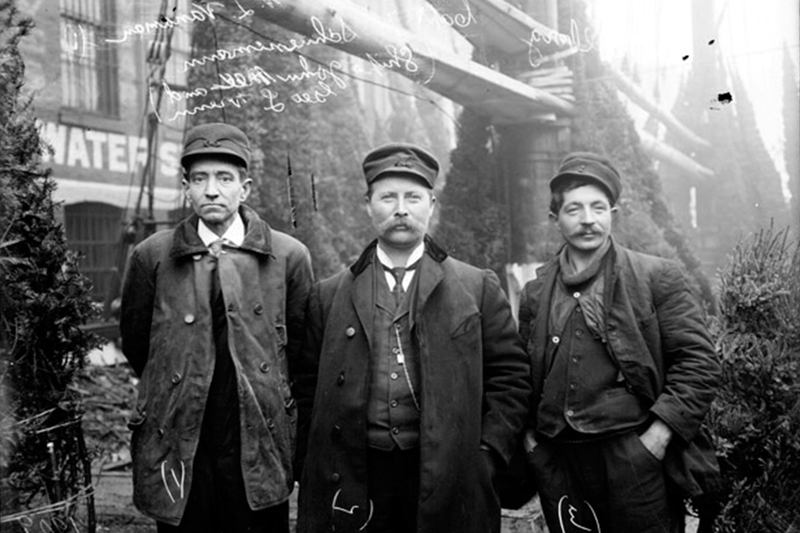 He was part of a trade that made Christmas trees — a traditional German custom — both accessible and popular in Chicago at turn of the 20th century. Many of the first “lots” were actually ships docked around the Clark Street bridge. Arneson says later generations of his family continued the trade, but made some changes. Instead of cutting down wild trees, they started tree farms, and the schooners were replaced by trains and trucks. These days, Arneson brings down trees from his own farm and others nearby. But with the rise of big-box stores, that model is fading. “Years ago — I’d say until about 25 years ago — there were more individual tree lots with people from up north bringing their products down to sell them,” he says. Nowadays, Arneson says, huge commercial competitors from across the country ship trees to big-box stores where trees are often less vetted and cheaper. Home Depot outlets in Chicago, for example, price 5-foot Scotch pines for $19. They retail 6-foot Fraser firs for $70. The stores offer spruce and fir varieties with price-points in between, too. But, Arneson says, he’s held in there. In recent years, he’s run six to 10 lots in various Chicago locations he rents across the North Side. He sells a variety of fresh Midwest pines, spruces and firs for about $40 to $90 for average size trees. He credits his survival to clients who are looking for something beyond the big-box experience. Each year, Arneson pulls off his own version of the holiday hustle, spending long days driving between lots, stocking trees and helping with night deliveries. He hires temporary workers to manage the lots, and this season they even include some Jamaican fireman buddies. “They bundle up and we got them some gear, and so far they like it,” he says. Mostly, though, Arneson says he hires construction workers and others Wisconsinites looking for seasonal work. Arneson’s model is one of the most traditional — and one that Chicagoans like Jessica are most likely to encounter. But there are others. Ivy Speck is a Wrigleyville property owner who uses her lot at Roscoe and Sheffield for Cubs parking during baseball season. But come late November, she transforms it into a fragrant forest of Fraser firs called Ivy’s Christmas Trees. On a good weekday, she says she can sell up to 100 trees, but that doubles on weekends. Unlike Arneson, Speck has the advantage of owning the property where she sells, but like other operators, she’s required to get an itinerant merchant’s license from the city that costs $50 a month. For labor, she says she hires her nephew and his friends for a few weeks. Speck says it’s a good business, but one that takes a while to master. One hurdle is figuring out the best trees to sell. The premium Fraser firs Speck buys from North Carolina have a reputation for growing straight, retaining their needles and smelling fabulous. Other cheaper varieties can fall short on any or all of these traits. When I quote the website’s estimate that a vendor can make $15,000 to $20,000 a month on tree sales, Speck also seems skeptical. Still, she notes that her profits are balanced by all the costs that go into her operation. These include staffing, shipping, delivery, supplies and packaging. But those aren’t the only business models that keep tree lots humming across Chicago each season. Some lots are actually fundraisers run by scout troops, schools or churches. They often do a mix of pre-order and on-site sales of trees on their properties. More are also popping up near restaurants, where outdoor seating areas can conveniently morph into tree lots this time of year. This includes 90 Miles restaurant on Clybourn Avenue, and Big Star, a taco joint in Wicker Park. Diners at Big Star sometimes become tree buyers and vice versa. 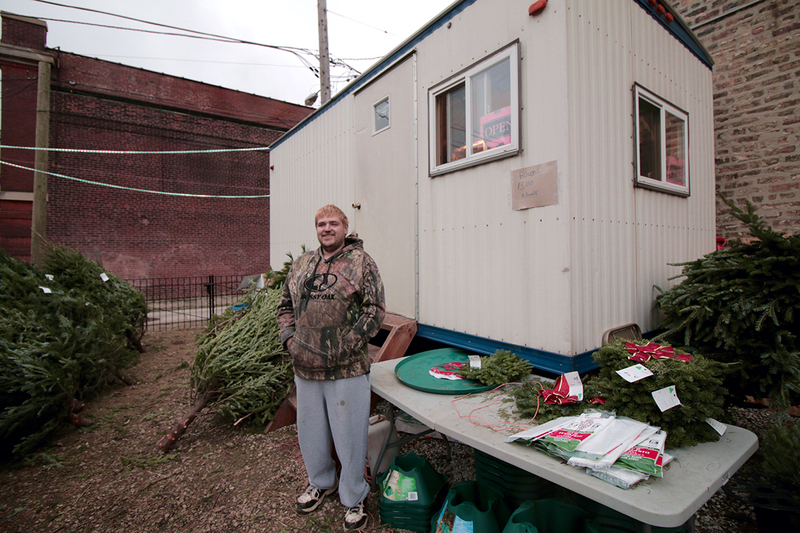 Chicago entrepreneur Chris Hohenstein has run the Big Star tree lot for five years. It’s an outgrowth of his online-only City Tree Delivery that he started in 2008. This year he has two physical lots that he says complement his online operation. Despite all the work leading up to the big day, all the vendors tell us they’re usually able to wrap up several days before Christmas — well in time to celebrate themselves. Arneson says he donates extra trees to charity or the Lincoln Park Zoo to use for the animals. As a last resort, he chips them up for mulch. But Speck says she has been experimenting with another solution. The week before Christmas she leaves all her unsold trees in the lot with an honor box and a suggested price of $20. And for the most part, she says, people prove pretty honorable this time of year. Jessica Tansey is an East Coast native who moved to Chicago in 2010. She works as the communication manager at The University of Chicago Consortium on School Research, which collects data on Chicago Public Schools. Jessica says she’s known as the “question queen” among her friends for her intense curiosity. As for her own tree, Jessica and her husband picked up a 7-foot Fraser fir the week after Thanksgiving. They got it at a popular garden center near her Andersonville home. But, she notes, she made the decision long before she met Ivy Speck.